The District moved forward with improvements to the current football, track and soccer facilities. After two positive public hearing sessions and numerous other discussions, the district administration believed the most fiscally responsible option was to renovate our facility at the high school rather than fixing a number of safety concerns we had at Haberkorn Field. The School District of Waupaca is in need of your support. The District is seeking community partners such as yourself to pledge a contribution to this project. You donation can span multiple years and will be used to help ensure the project moves forward in a timely manner. Additionally, donors have options, dependent upon the contribution level, to have their business name prominently displayed at the high school stadium for thousands of fans to view every year. The District is seeking $1,000,000 in donations to offset the costs of the improved high school stadium. Please consider supporting this opportunity to improve our athletic facilities and reflect the Comet Pride for which Waupaca has become known. Your tax deductible contribution will demonstrate your commitment to the students and community members who call Waupaca home. Haberkorn Field served 140 students per year for football. The proposed cost to make Haberkorn field safe for spectators was $730,000 and achieved nothing for actual field improvements. The new track, soccer, and football facility will serve upwards of 1,000 students per year for soccer, football, track, and physical education classes. The cost of $2,300,000 includes a new field, track, grandstands, and amenities. More students would be able to access and utilize this upgraded facility. Please join our efforts to improve the multi-sport Comet Field on the high school campus. 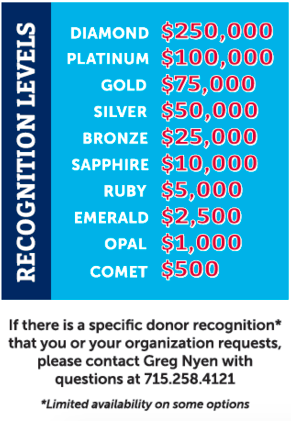 Donors who contribute at the Donor Recognition Levels noted on the left will be recognized on the Comet Wall of Honor. The wall will be made up of tiles according to the size of the donation made as in the above image. Your contribution will help ensure that in the future our students and community will have a better facility. Please download the Donation Brochure & Request Form for information on making your donation.